There is always more in store for you from God. But you have to seek God to receive His blessings. There is so much more Christ wants do in and through, but you have to be willing to seek His plans and His desires. God loves you. If you seek Him diligently, then He will always reveal more and more and more of Himself to you. Seek the Lord. Move forward in Christ with confidence and faith! Do you seek the Lord? Anybody can claim that they want more from God. Anybody can go on about how they want to blessed, but receiving God’s best takes work! God rewards those that diligently seek Him (Hebrews 11:6). Not just seek Him, but persistently go after God with a fervent passion. Do you want new things from the Lord? Are you ready to know Him more? Then you have to seek Jesus diligently! Make time everyday to be alone with Him and get direction. Study His Word to get closer to Christ and grow spiritually. Surround yourself with serious Christian family and friends who will help you walk in the Spirit. Move forward in Christ and never look back! There is something new in store, but you must let go of the past. Too many people can’t truly move forward in life because they spend too much time looking backward. If you are a true believer, then God has freed you from your past. Let it go. The past is just that. What’s done is done. If you want something new, something greater from Christ, then you must leave the past alone. It is time for new ways of thinking. It is time for a new attitude. There is a high calling from God. Move forward in Christ and never look back! If you want something new from God, then you must do something new. No one reaches new levels in life simply by doing the same old things. When children want more responsibility they must prove they are ready for it. A promotion usually comes after a positive performance evaluation. And so it is with God. Only a fool would expect more from Him without putting forth any more effort. Are you ready to experience Christ more than you ever have before? Then it’s time to study like you never have before. It is time to worship like you never have before. It is time to seek Him more diligently and more fervently. Our lives are to be living sacrifices to the Lord Jesus Christ. The more we yield ourselves to Him, the more we can experience ALL He has in store for us! Christians, God has called you to be different. He has called you for His specific purposes. God has chosen you to represent Christ in the world. You are supposed to be showing the world the beauty of coming out of darkness into light. Nothing in this world can compare to working for Christ. Fitting in with the crowd. Acquiring more and more material things. Nothing. Living for Christ is the only thing that will benefit you now and forever. Be separate. Be holy. If you are a true believer, then God has called you to be different. God has called you to stand apart from the crowd. As Christians we are not meant to fit in. We are to represent Christ to the world. Jesus Christ stood out from the world and therefore so should we. How else can we show people the benefits of being a follower of Christ? Our mission in this world is to be witnesses for Christ and lead others to knowing Him. If we act just like everyone else, then the world will see no reason to be saved. Living set apart is difficult sometimes, but the benefits outweigh the pain. Let your life be a testimony to the goodness of Jesus Christ. Why? So that others will want to know Him simply from watching you. Be separate. Be holy. Just keep holding on. You may not know when He is going to come through but you know that He is. You may not know what your blessing is just yet, but know that Christ has one with your name on it. You may not know how the Lord is going to work it out, but He does. Be strong. Keep the faith. 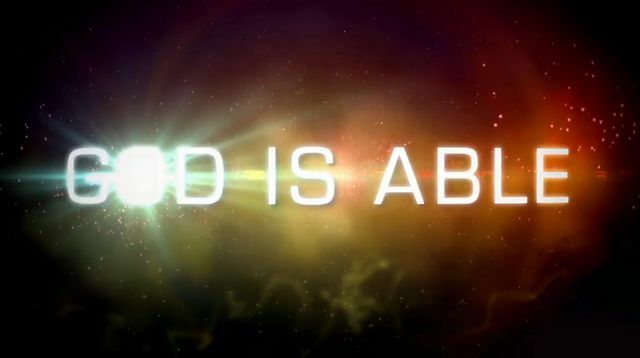 God is able! Besides Jesus, who else can you trust? Most of us are guilty of trying everything else first, then running to the Lord. But no one or no thing is as reliable as Him. Our friends and family can only do so much. Our own intelligence can only take us so far. Money can only do so much. Time after time these things continue to disappoint us. Yet, Christ always supplies what we need. Many of us need to get our priorities in proper order. Do you trust the Lord? Do you trust Him will all of your being? If so it will be shown in your actions. Not only will you tell other people to trust God with your words, but also with your actions. You will learn to pray when others are worrying. You will live righteously when others are still in the world. You will continually learn to follow the Lord no matter what happens! Do you believe that God is Able? He is! Keep the faith. Exceeding abundantly. The NIV says ‘immeasurably more.’ God’s power is just that great. It is greater than anything we can imagine. Whatever your prayer request is; Christ can do much more than what you ask for. From overcoming your greatest fear, to finally dying to sin, to pursuing a goal that you believe is too lofty. God can fulfill your heart’s desire and much much more. If you are a born again believer then that power is in you. Whatever task seems so complicated to you is less than easy for the Lord. Whatever you feel led to do; have confidence knowing God is able to do way more than what your mind can even comprehend. The extent of His power is not even able to be measured. And that power resides in you. You can do it. Keep the faith. Why? Because God is able. Whatever you can’t do; God can. We serve a God that specializes in the supernatural. Our Lord is a Master of the unthinkable. Jesus Christ truly does have all power. We miss out on our blessings because we spend way too much time dwelling on where we fall short. The God we serve, however, has no weaknesses. God is supernatural. If you take care of the natural, then Christ will handle the super. When God lays something on your heart He knows what you can handle. Just do what you can and the Lord Jesus will handle the rest. Don’t dwell on who you are, but think about who God is. God is Able. Keep the Faith. God is able to do anything. Don’t forget that. When we ask Him for something and it doesn’t turn out our way we get discouraged. We wonder “is God still God?” “Is He still there for me?” Let me assure that Christ is still just as powerful now as He has always been. He has not forgotten about you. A delay from Jesus is not a denial. When it seems like you are not getting through there could be for several reasons why. You may not be ready to handle what you're asking for. You may be asking for the wrong thing. God might just have something better in store for you. He may be testing you. Don’t give up in the Lord. Remember He works in a way that your mind just can’t understand. Keep the faith. God is able. At a college graduation I heard a speaker say, “There are millions of paths to get you from birth to death. And they all work.” There are so many ways to spend your life. You could try to earn the most money, have the most successful business, be the most well-known person, or pursue whatever your passion is. However, there is something that God has just for you. When you try to pursue something else your results may be alright. But when you walk into what God has set in place for you; success is inevitable. Don’t try to just be the best or stand out from the crowd. Just seek Christ’s plan for your life. It’s already yours. Go get it! Do you believe God? If you are a child of God, then He is calling you to do something. It may be something that you feel is beyond your abilities. It is probably something outside of your comfort zone. Many of us will stand in church and sing ‘Standing on the Promises of God’, but when you really trust God it will be seen in your ACTIONS. Do you really trust God? Your answer is not in what you say, but how you live. If you feel Christ calling you to a certain task don’t run. You may feel that it is too much for you. You may wonder if you can handle it. You can’t, but the Lord can. Do you REALLY believe Jesus? Then have faith in what He tells you and walk into something greater than you ever imagined! This is part of the affirmation God gave to Joshua as Joshua prepared to lead Israel to the Promised Land. God knew what He had for Joshua. He chose Joshua to be His servant. He has specific goals for Joshua to reach. All Joshua had to do was follow the Lord’s instructions. Be strong, friend. There was nothing special about Joshua. God was with him and He will be with you. Have courage knowing Christ is on your side. Stay immersed in the Word of God. Keep walking on the straight and narrow path. You may not know exactly where you are going, but Jesus does. What he has for you is already yours. Just stay strong until you reach your own Promised Land! God already knows what’s ahead for you. The God we serve exists outside of time. He knows the ending of everything before the beginning. Some of us are able to make good inferences about the future based on our intelligence and past experience. But God knows your future! If you feel the Lord leading you in a certain direction, then go. Don’t worry about if you’re smart enough. Don’t waste time trying to figure out how to finance everything. Stop wondering if you can make it to that next level. You don’t know, but Jesus does. It’s yours!!! Labels: Bad Teaching, Blake Griffin, Brian McKnight, Chris Brown, Clippers, David, G. Craige, God's Friend, Obama, Rajon Rondo, Ray Allen, Too busy for the Lord??? There are goals, achievements, and accomplishments in this life that the Lord has set specifically for you. No one can take them away. No one can do this task quite like you. Why? Because Christ has a specific plan for YOUR life. When God ordains something to be; it is done. What the Lord sets in place it set. Plain and simple. Don’t waste time looking around at what someone else is doing. Just know that every born again believer is given gifts to be used for God’s glory. You are unique. You are special. Jesus has something just for you! There is only one way to have unity, real unity, with others and be at peace in your own life. And that is be led by the Lord. Before we try to love others we need to let God’s love transform us. Does your heart belong to the Lord? Does He have your soul? Does Christ have your heart? Let your life be an act of praise and worship to the Lord and watch everything else fall into place! There is only one way to have unity, real unity, with others and be at peace in your own life. And that is be led by the Lord. Before we try to love others we need to let God’s love transform us. Does your heart remind to the Lord? Does He have your soul? Does Christ have your heart? Let your life be an act of praise and worship to the Lord and watch everything else fall into place! How is your relationship with the God? It is a blessing to know that we can never lose our salvation. However many of us are not taking full advantage of this awesome relationship. Think about any two family members. No matter what happens between them, they are still family. However, if they have been estranged for years their relationship will be withered and have no meaning. Are you estranged from Jesus? When was the last time you talked to the Lord? Not just a family dinner prayer, but really talked to Him about your life. When was the last time you had some alone time in the Word? Just you meditating on the Bible and contemplating how it applies to your life. When was the last time you just spent time with God? Spending quality time with friends and family is always a good thing. The psalmist says here that unity is good and pleasant. Unity between our fellow man does not always come easy, however. Sometimes we have to look past certain things and make real sacrifices in order to achieve that togetherness with our friends and family. The following is what I like to call the three C’s unity; Commitment, Communication, and Confession. We must be dedicated to reaching out and doing our part to keep right relationships with other people. We must open our mouths and say what is on our minds. Think about how many relationships have been broken simply because someone didn’t express their feelings and a misunderstanding arose. We also need to confess and admit when we have done someone wrong. An apology goes a LONG way and so does forgiveness.